This is a long weekend for us, both in the sense that it spans 4 days, and that it drags on and on. We try to enjoy family time but it's so hard for the boys not to have their school/therapy routine. We try not to let them bounce around in front of The Wiggles and the Wonder Pets all day long. I keep wanting to write thoughtful, sweet and funny blog posts but can't get even a few minutes of uninterrupted time in front of the computer. The places we always go are probably the worst places we could possibly take them to this weekend; Target and the mall. We did go through Target briefly yesterday and they seemed okay, but I wouldn't want to wander around there too much. Yesterday Aliza demanded that we put up a few Christmas decorations. She dressed for the occasion. 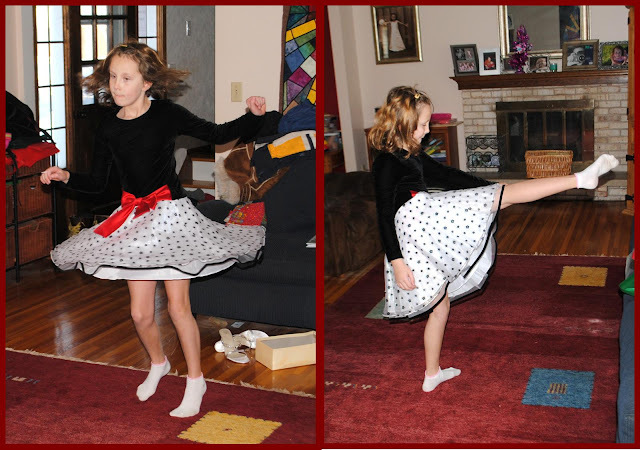 I can put up Christmas decorations in sweatpants and feel just as merry, but Aliza needed a Christmas dress. 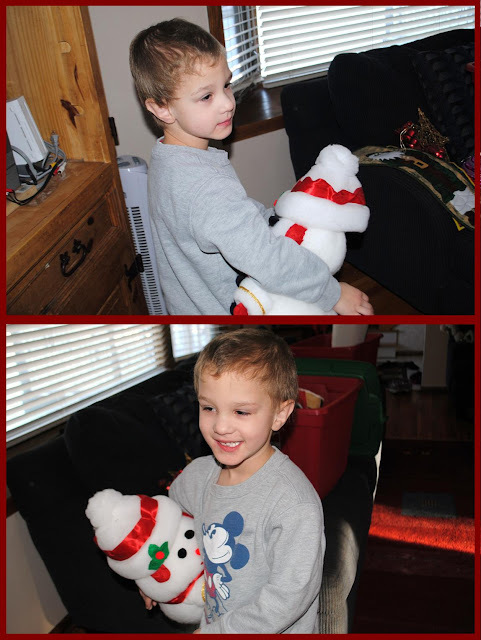 AJ ignored us while we unpacked Christmas bins, but Zack decided he really liked this snowman my grandma made. He might love it to pieces, we'll watch him with it, but I know his great-grandma would love that he loves it. That is sweet. I'm sure my mom would tell you that I dressed up for everything too when I was little. What kind of school do your boys go to if I may ask? Ha, we are DYING of the long weekend this weekend. On normal weekends, by Sunday my son is going crazy waiting to get back to his routine so this weekend is particularly nutty! Here's to it moving fast! They go to kindergarten at our public school, and are in the autism program there. They are a part of a regular kindergarten class too, and are in there for about 20 minutes of their total 2 1/2 hours at school each day. Then we have ABA therapy at home for about 6 hours. Long days but they enjoy them!